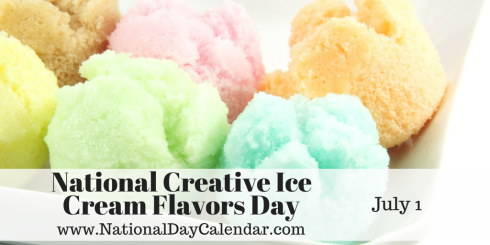 1st of July: NATIONAL CREATIVE ICE CREAM FLAVORS DAY!! July 1st celebrates National Creative Ice Cream Flavors Day, a day to ponder over, or taste, the many creative, awkward or just plain silly different types of ice cream flavors. It is meant for more than the love of the traditional vanilla, chocolate and strawberry ice cream. Celebrate by venturing out to your local ice creamery and testing their many flavors, or head down to the grocery store and get creative with finding different ingredients to make your own! You can also try to find some crazy flavors yourself! One that I find interesting is bubblegum icecream….Willing to try one? 🙂 and if you’re an ice cream lover, today eat all the ice-cream you can!! lol…. From the Team, Happy National creative ice cream flavors day to you!